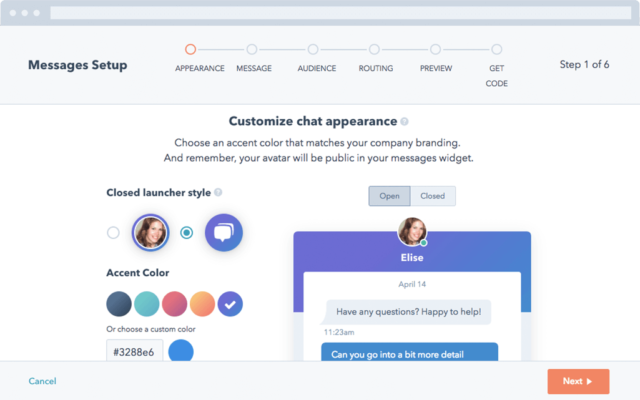 These live chat software features have made chat a popular way for marketers and salespeople to connect and convert website visitors at a higher rate. That means that most of your website visitors decide to leave your site — many of them never to return. Of course, some of those visitors do click deeper into your site — visiting pages like pricing, features and your blog — to learn more about your brand. And they might return at a later date. But, if you want to deliver an excellent user experience, you should use chat to directly answer their questions on the page where they landed. That way, they don’t need to dig through your website or fill out a form and wait for a response. According to the Nielsen Norman Group, you have just 10 seconds to communicate your product’s value to the typical first-time website visitor. Chat is your opportunity to do just that. Live website chat is a low-pressure way for site visitors to ask questions without completing a form, or being forced to wait hours or days after filling out a form. Some marketers even use bots to respond within seconds to common customer questions. If there is a specific question or high-value prospect in the chat, a human can jump in and start chatting. For some, lead conversion rates double due to their ability to quickly address common misconceptions and concerns via chat. To figure out the tools and features needed to achieve these types of results, we asked digital marketers from the Databox Partner Program and beyond to share the ways that they have deployed live chat, and the successes they have experienced in 2018. Here is what they shared. We grouped the responses by individual software tool so you can see the advantages/disadvantages of each popular tool. Drift is the most popular live chat tool among Databox customers, so that may be the reason that we received so many positive reviews. However, they have also released a series of features that make it dead simple for marketers and salespeople to collect more leads. Their permanently free version allows anyone to quickly get started, and their chatbots help you answer common questions instantly without human intervention. Favorite Feature: The best thing about Drift is the ability to have the bot ask qualifying questions and book meetings while you’re busy doing other things. It’s been a game changer for my client, SafetyPro Resources, who just implemented this on their website. We had a chat tool before, but it required a live person for all interactions. With the DriftBot, they’re seeing more conversions, more blog subscribers, and their busy consultants don’t have to be available to respond to live chat at all times, only when a lead is pre-qualified by the bot. One Thing To Improve: I wish they offered a lower-priced paid option for smaller businesses. Favorite Feature: The playbooks are, without a doubt, my favorite feature. We use them to start interactions even when we’re not online to answer the site visitors queries. How? We set them up to direct people to high-value pages, areas of interest across the site and to book meetings for our sales team. They’re amazingly powerful yet simple ways to drive more engagement and leads while also decreasing sales cycles. One Thing To Improve: At the moment, the integration between HubSpot and Drift isn’t as strong as Drift and SalesForce. I would love for the conversations, including their contents, not just their levels of qualification (CQL) and user details to be shown as part of the contacts timeline. But that’s very specific to us as a HubSpot partner. Favorite Feature: The free version of Drift has worked very well for one of our customers, increasing inquiries on their HubSpot website by 40%! Turns out that their website visitors like to remain anonymous for as long as possible whilst they are researching the answers to their questions. But our client’s receptionist is such a charmer that she is usually able to reassure them sufficiently to give their email address and bring them into the sales pipeline. On a WordPress website that we built for a different company in their group, the same receptionist received a strange message through the Drift interface. The contact wanted to speak to a person whose name she didn’t recognize. Our client asked us to investigate… It turns out that someone had cloned our client’s entire website – very badly. They had removed every mention of our client in the copy and replaced it with their own company name and phone number – including in the testimonials. Also still in place were our client’s photos, logo and registration number along with sitewide footer links to Lollipop! But the bit that caught them out was that the cloned website included the Drift functionality right down to the image of our client’s receptionist. It was this that allowed the cloner’s unhappy customers to communicate with our client. One Thing To Improve: To be able to add the Google AdWords tracking code to the chat box so we can measure conversions properly in the AdWords dashboard. Before we added Drift to the site, we were getting a good conversion rate on a landing page with a contact form but our visitors much preferred the live chat option. Suddenly our conversion rate tanked. As a result, we now have to manually check each conversation in the Drift dashboard for the gclid code to work out whether the exchange has been instigated by an ad. Favorite Feature: I love the #DriftLink feature, as it can easily turn every page, post, email, image, social share or button into an opportunity to convert visitors into leads or start a conversation with prospects. If you run an agency like me, you know how much time it can take to set up a landing page, thank you page, confirmation email, and workflows when creating a campaign. With a #DriftLink, you can just set up a playbook with a link that will make the lead bot pop up on your website and have it deliver whatever you are offering to visitors. This takes a lot of work off my plate! An added bonus is how user-friendly this approach is to people who browse your website on mobile devices. The conversational interface is way easier to use. Visitors can tap on the different options instead of filling in a lengthy form! One Thing To Improve: I still think that the integration between Drift and HubSpot is not as tight as it could be. Segmenting contacts into lists based on Drift properties is not as easy as it should be. This can be a limiting factor if you are not ready to ditch all of your landing pages and email lead nurturing flows. Favorite Feature: The ability to have a llive view of the current site visitors along with their partnership with Clearbit allow the team to communicate with not only any visitor but more specifically the visitors you want that are high value. Depending on your Lifetime Customer Value (LCV) it may only take a few conversions to have a positive ROI. One Thing To Improve: The one thing that I would improve would be the ability to detect and chat in multiple languages. Favorite Feature: I like LeadBot the best. You won’t believe the improvements we’ve brought to our clients by automating the front-end of sales conversations with AI powered by Drift. It’s truly a game-changer. Not only do we convert MORE leads, our clients’ sales leaders report better QUALITY leads, which are more ENGAGED and more likely to RESPOND to follow up. I attribute all of this to the notion that the website visitor, having engaged in conversation, feels that they’ve been “heard.” A wise person years ago told me that God gave us 2 ears and 1 mouth; use them in that proportion. Drift powers this truth at scale. Favorite Feature: We love Drift Playbooks! They are super context aware. What this means is that it feels like a real human being opening up a conversation with you, but at the same time you still know it’s a machine you’re chatting with. For customers, this delivers a much-improved buying experience that is quicker and easier, and for marketers it enables you to have conversations at scale to better engage and qualify prospects. Drift Playbooks bring marketers closer to their customer and sales team, whilst transforming communication from a one-way monologue to a two-way dialogue. Go try it out now! One Thing To Improve: I would love to have the chat availability automatically aligned with my calendar availability. Having Drift automatically set me to Do-not-disturb mode would save me from having to manually set it up. But given that Drift launches a new product every month, we wouldn’t be too surprised to see this update sometime soon. Favorite Feature: The ability to make the conversational marketing/chatbots hyper-contextual to the page or campaign that the bot is on. The chatbots can be triggered in a variety of ways including a simple on-page link which can lead to incredible conversion rates. One Thing To Improve: The mapping and conversion tracking in Hubspot and reporting options for drift are somewhat limited (but improving drastically even over the past 2 months). Favorite Feature: I recommend the free version of Drift Chat to every client of mine. Out of all the tools we have ever used, Drift Chat Free has been one of the quickest and easiest to set up. it’s had a huge impact on our business. All you need to do is add one simple script in your website (as easy as installing Google Analytics). And even if you don’t know how to do that, the instructions on their site are extremely easy to follow. Drift Chat is Free. That doesn’t mean free trial. It is straight up free. You don’t even need to consider paying for it until you add 100 new contacts by using it. It has an iPhone mobile app and a Slack integration so you can have conversations as easily as you can texting someone. The ability to answer chats on mobile has led to a ton of new deals I would never have won. Having the mobile app makes me available all the time. User Experience is great for the visitor. When you “choose” to engage as a visitor, the experience is smooth and pleasant. Drift Reporting has gotten a major upgrade for all users. It wasn’t always awesome with that. But it’s way better now. It’s incredibly good for Salesforce users. They have closed loop revenue attribution. You can also get great Drift reporting inside Databox with a free Drift reporting template we developed. One Thing To Improve: We’d love for Drift to keep building out the API library. The best thing would be to build a reporting API so we can connect it to external reporting tools like Databox and get more robust analytics through the API. Favorite Feature: The bot, for sure. It helps us solve two essential questions when using live chat for sales, as we do. The first one is availability. In my opinion, it’s imperative for live chat to respond quickly to visitors and with a short and concise response. The bot allows us to do that when we’re not able to be online. The second thing is that it quickly evaluates whether it makes sense for us to continue talking with the lead. This way we make sure that we don’t waste our time and more importantly don’t waste the lead’s time. The bot does this by asking a few, short questions about things like services they need and their budget. One Thing To Improve: I’d love to make it even more personal and find a way to make it less intrusive when popping up while the user is browsing the site. When a chat pops up with a generic question like ours, many just discard it as a pure reflex. If we can use more information about them as early as possible in the process to make it more relevant and personalized, I am convinced that it will bring better results. I also hear from clients that it can feel weird to chat with a bot if you’re not an internet power user. Making it more personal would improve that experience. Favorite Feature: The feature we like best is the scheduling bot. Allowing people to book a time with us through the website is invaluable. The majority of our sales require at least one meeting to discuss the project in detail, and getting the meeting booked as quickly and seamlessly as possible is incredible. One Thing To Improve: We’d like to be able to perform the “Live View” of who is on our site in real-time from mobile devices. Right now, we can only see desktop users. – “Hey, is the date X good for you? One Thing To Improve: The HubSpot integration is not working as well as we’d like. Favorite Feature: I love that we can respond from the tools we already use. Using other chat tools, it was difficult to respond in a timely manner, but that’s not the case with Drift. The ability to manage conversations in real-time from their mobile app, web browser and Slack makes it extremely easy to reply to inquiries in a timely manner even for small teams. One Thing To Improve: I suggest they work to improve their Slack integration. The ability to reply to individual chats is great, but it creates a new contact in Slack every time you respond there. Their ability to reply within the #chat-leads channel without creating a new contact would be fantastic. Favorite Feature: A free version of an outstanding tool with easy Slack and website integration, what more could you want? Favorite Feature: How it easily engages people on our website. A visitor now comes to our website, and when they would previously just disappear without us knowing, they now often see the chat feature and engage with us. Visitors turn to prospects, prospects to leads, leads to customers. One Thing To Improve: I would improve the Drift support functionality to ensure everyone is in a place to set up their chat in an optimal way from the get-go. Sometimes it can be a little tricky and difficult to optimize. Favorite Feature: Targeted chats allow us to proactively chat with the visitors who are most likely to buy from us. For example, we have certain messages that appear when there’s a visitor from a 200+ person company and a completely different message for SMBs. This personalization at scale gives us the ability to tailor the right message to each visitor. Favorite Feature: I love the profile link feature that you can display anywhere so people can start chatting or book a meeting straight from your bio or email signature e.g. aboutinbound.drift.com/vourneen . I also love the fact you can start using live chat for free on Drift. As a Hubspot customer, I have to pay an additional amount to use the live chat functionality. One Thing To Improve: To be honest, there is not much I would improve with Drift, it is a really great tool. However, at the beginning I found the user interface a little unintuitive. For example, I struggled to find where the reporting was located in the tool. One Thing To Improve: If Drift added a CRM element, (where we could manage pipeline directly) I think there is a case to be made that it would be the best CRM for most people. Favorite Feature: I love having control of when to show chatbots to certain people. Drift’s targeting gives me a ton of control over who sees what. Being able to set chatbots to show based on number of visits, whether they’re coming from a certain referrer, or based on the page is so valuable. Chatbots need context and Drift lets me do that easily. One Thing To Improve: Drift has a built-in contact segmentation engine that at times can be a little difficult and confusing to use. Favorite Feature: The immediate capture of someone’s information and question in chat-form is so much more compelling than our traditional form-based models. We have only used the free version so far, but Drift has proven to be an invaluable way for our marketing team to quickly address questions from potential customers and get them to the right resource faster. The faster we can help them, the more we can know about their needs and how we can add value as a sales development partner. One Thing To Improve: Because we use the free version, currently there’s no way to pick which web pages Drift is active on. It’s a great asset on pages without stronger CTA’s and other info-capture tools, but when they overlap on some cornerstone pages it can get pretty crowded. Favorite Feature: Drift is really fantastic at sifting through the noise — it automatically qualifies great leads while disqualifying spammers, like list-selling companies. One Thing To Improve: The integration with Salesforce could use a bit of work — because of the Clearbit fields auto-populating, we had to create new custom fields to sync relevant data. The Messages tool is included with a subscription to HubSpot Sales. It may not have as many features as other chat tools, but since it is part of the HubSpot ecosystem, it has the best integration with the rest of your inbound marketing process. Favorite Feature: HubSpot Sales Pro offers Messages (their Chat tool), which offers a direct line to the assigned sales rep and the ability to take a conversation right into a scheduled meeting or registration form. It shortens the sales cycle dramatically. One Thing To Improve: Better round-robin capability + settings on Messages. Intercom was one of the first companies in this space. Since they are also a popular customer support tool, they are a great option for improving communication between sales and customer support. Since they have been around for the most time, they have the most comprehensive set of features. Favorite Feature: The best things about Intercom are their internal integrations between tools and connection to 3rd party tools. Their bot is pretty new, their knowledge base is also pretty new but they all go hand in hand and eventually, I’m sure it’ll be great. From iOS to the website, to email, to Facebook, it all goes to the same inbox. Then it sends data to a 3rd party tool like a CRM if you want. It just works and that’s how I like it. One Thing To Improve: I would definitely love to be able to record and save videos right inside Intercom. Favorite Feature: The operator directs customers to support agents and leads to the sales team using rules. This makes sure we can respond appropriately and give the most applicable information. One Thing To Improve: One thing that would be of real help would be more sophisticated out of office messaging. Being able to tell the person on the other side of the live chat that they’ll get an answer in under 24 hours, for example, or slightly longer if there is a national holiday or high volume of inquiries. 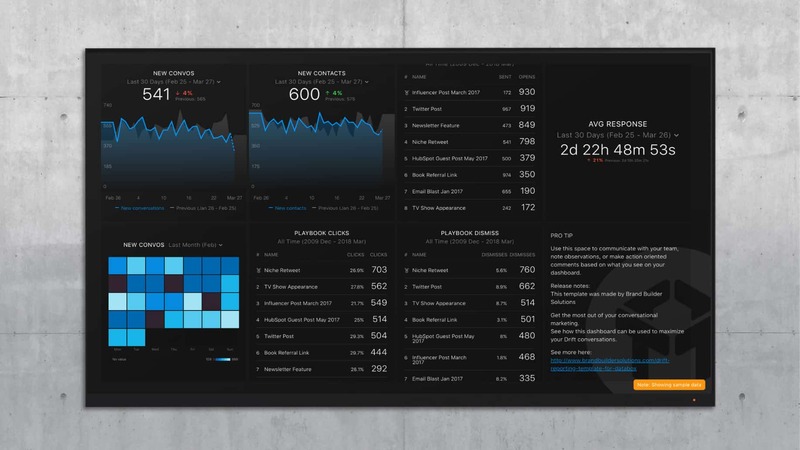 Track your Intercom metrics alongside 60 other popular services in a free Databox account. Favorite Feature: Auto Messages. This means that we can send a targeted message to a site visitor based on what page they are viewing. It’s very effective and because it has the ability to embed image files, we can send memes or infographics in the messages in order to help personalize the experience and make our company more relatable. We have seen a big increase in people contacting us because of how great the auto messages are. One Thing To Improve: There is not a whole lot I would improve. It really does everything we need it to do. It integrates with all the third party services we use. It is more expensive compared to some of the other chat options out there, but that would be our only improvement. Favorite Feature: I think the best feature of Intercom is its ability to handle both support and sales inquiries from anonymous users. Coupled with automated messages and assignment rules, it saves us a lot of time to either have these conversations qualified by our SDR team, or processed by our Support team. It reduces the number of questions asked to our support team as people are encouraged to search in the help center, in a very smooth way. It is also particularly useful for our users that are already on our platform, because we can then access previous conversations, and also get access to quick information on the customer. Intercom enables us to get profile enrichment with the Clearbit integration: it helps us better qualify the prospect and push specific messages to segmented audiences. One Thing To Improve: One thing we’d like to see improved on Intercom is customization. Intercom as a dev framework would be amazing since Intercom is great for many things, but not the greatest at any. We also haven’t seen Intercom offer any account based (and not customer based) communication, which would be a welcome addition. One Thing To Improve: The design functionality is pretty basic, just a change of color or addition of a logo. It would be nice if we had a bit more control over this. Favorite Feature: I love it that we can transfer chats to other agents and that we can see on which page people are on. This makes it easier to help people as much as possible. One Thing To Improve: Making it easy for us to filter out specific countries. At the moment, we need to add additional code to the website to make this possible. Favorite Feature: I like Olark because it’s easy to integrate with chat software I’m already using, like Trillian. I never miss chats because it is available on my desktop and phone. One Thing To Improve: Better desktop notifications. Favorite Feature: Through the HubSpot/SnapEngage integration, new leads are automatically created in HubSpot when a website visitor engages in a chat. This allows us to add the actual chat transcript to their contact record in HubSpot, which allows for further segmentation of leads based on their chat discussion, and gives us opportunities to nurture these contacts via workflows. This closed-loop process saves time, improves the sales process, and decreases the time to close. One Thing To Improve: It would be ideal if SnapEngage connected more directly with HubSpot contact properties, smart fields, and form dependencies to help gather more contextual information on the SnapEngage chat form. Favorite Feature: Chat Heroes provides a member of staff with their service to answer your website visitors queries live during the chat. Favorite Feature: Eighty to 85% of your questions could be handled with a chatbot and that frees up your team to accomplish tasks and solve more pressing issues faster. What’s crazy is we’ve figured out that, especially in our industry, that a small amount of waiting time will piss people off. Enabling them to get on with their purchase with chatbots and then notifying someone when it’s time for them to hop in if necessary has been a big help. It’s easy to get started and control the volume. For example, at Databox, we’ve had 700 conversations with people on our website and in our app this month. But, when we started, we had just a 100 or so. And if we really wanted to, we could have thousands of conversations just with users of Databox, not to mention thousands more conversations we could have with our website visitors. The point is: you can start slow. Start by putting live chat on just a few pages: Even if you have a massive amount of traffic, you can start by deploying the chat widget on just one specific page. For example, you can start with your pricing page since many of those visitors should be more qualified to talk to a salesperson. (This is exactly how we started.) Or, you can start on your homepage, and learn about the questions that prospects have after their first impression of your brand. (We did this too.) Be prepared to bulk up your content based on the common questions you get. Create content to address commonly asked questions: Based on the common questions we received, we altered our content calendar quite a bit. First, we improved our email and in-app nurturing and onboarding processes for new users of our free app. We also created a bunch of short videos to address common questions and to guide usage of our app. Then, we changed our blog strategy to address common questions people have about improving specific metrics like this article on how to reduce response time with live chat and this one about reducing bounce rate. 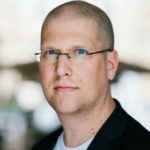 Book calls for your salespeople: If you deploy chat widely on your site, you should be prepared for a much higher response rate from site visitors, compared to traditional forms. Because of the volume and because we only have one salesperson, we push our visitors to attend a webinar or watch a recorded one. But, in most companies where salespeople have to spend time prospecting, be prepared to let prospects book time on your salesperson’s calendar. Finally, if you’re concerned about the cost of implementing chat – you should be able to figure all of this out for free or at a very low cost! Drift starts at free and most of the other tools listed above start at just a few dollars per month. When you’re ready to ramp up, here’s the key to maximizing your live chat ROI.